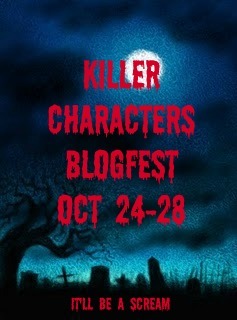 Today marks the beginning of the Killer Characters Blogfest! It's going all week long and I'm excited for every minute of it! To start off the week we're talking about killer supporting characters, and you know I couldn't pick just one. First up we have the lovely and oh so kick-A Nellie Gomez from the 39 clues series. If you haven't read the books - they're about a bother and sister who have to travel around the world searching for clues to make them the most powerful Cahill's of all time (and that's saying something) of course an elven-year-old boy and fourteen-year-old girl couldn't possibly travel the world alone. So why not bring a babysitter opair along? 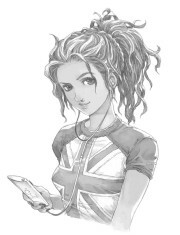 One could see the attraction these two young kids have to this nineteen year-old, streaky-haired, pierced nose, iPod toting, tri-lingualist, but she has oh-so-much more hidden up her sleeve. She's the life of the party to say the least and fierce protector to say the most. Would I like to get in between her and her goals? Not in a million years! Next on the list is the Seven-Year-old flying diva from Maximum Ride, Angel. If you haven't read the series - Maximum Ride is the name of a teenage girl who leads a flock of flying Children. Their mission? To save the world. Don't let Angel's sweet face and blond hair fool you into thinking this little girl is innocent. No, she has big plans to become the leader of her flock, and a very creepy ability when it comes to reading minds (and changing what people are thinking along the way). At first you just think she is cute, but as the story goes on so does your opinion of what cute really is. Last, but certainly not least, is Cinna from The Hunger Games. If you haven't read the book - what planet have you been on? The Hunger Games is a dystopian where kids in the rage of ages 12-18 are "chosen" to fight to the death for the entertainment of the capital in a format that is all too reminiscent of today's reality T.V. Who is Cinna? The stylist who is bold enough to stand up to the capital even though he has a life of ease. Don't think a stylist can be a hero just be designing clothes? You'll think again when you read about Cinna's form of expression. That hardly touches the tip of the list, but I have two more posts to write and I don't want to use up all the good books! What's your favorite supporting character? P.S. What do you think of my new blog design? What do like or not like about it? This is my first visit to your site, so I don't have anything to compare, but I like the current layout. As for killer secondary characters, I'd have to go with Ellegon from Joel Rosenberg's "Guardians of the Flame" series. He's a dragon. Enough said. Unless you meant "killer" in the literal sense? @Joshua Dragons are the best! I'm totally checking that book out! I haven't read the 39 Clue Series yet but as for the other two I have to wholeheartedly agree. They are awesome! The first is called THE SLEEPING DRAGON, and there are 9 more after it in the series. There are omnibus versions of the first 7 books in the series containing books 1-3 (GUARDIANS OF THE FLAME), 4-5 (GUARDIANS OF THE FLAME: LEGACY), and 6-7 (GUARDIANS OF THE FLAME: TO HOME AND EHVENOR) respectively. Books 8-10 are still individual (NOT EXACTLY THE THREE MUSKETEERS, NOT QUITE SCARAMOUCHE, and NOT REALLY THE PRISONER OF ZENDA). This series is his fantasy work. I'd also say not to dismiss his other works. He wrote 24 books—covering fantasy, sci-fi, murder-mystery—before his passing in June, and I've never been disappointed in his work. The man, himself, was a great friend, and I'm always happy to introduce new people to his stuff. Oh, I love Nellie and Cinna. Great choices :) And thumbs up for the new layout. Ooh, I love Angel and Cinna! Great choices! I'm reading Rick Riordan's The Lost Hero right now and loving the character Leo. Your blog design feels more "open"--I like it. I've heard of 39 Clues and I really want to read them, but I've never heard of the second one before. You certainly have hooked me into wanting to read it, though. Nice! You obviously put a lot of thought into these choices. They are all fantastic! But Cinna is my favorite. Great job! Oh, and I like your new background! Sounds intriguing, thanks for the info/review! I like your new layout. I haven't read the first two and they sound so FUN. Cinna is AWESOME. I thought about doing him, but I already have Hunger Games for another post. Great job! I love the blog design! And I love your characters. I was such a huge fan of Cinna. Thanks for choosing to post about him. Visiting from the planet Oblivion (I swear reading Hunger Games is at the top of my to do list once I crawl out from under my thesis) I now have several books to add to my TBR list. I'd only heard of Hunger Games, however 39 clues sounds awesome. As for the layout, the side bars feel a little overwhelming but I really like the pastel blue background. I do love your new design=) I've only read the Hunger Games and I have to agree with you about Cinna. He is definitely a hero in the series. Awesome choices! I love Cinna! LOVE! The other ones, I haven't even read the series' yet, but that means you just hooked me up with some great new "must reads." Love the new blog design. I would like the background to be a little more colorful or just a shade darker. But that's me. I know people tell you to keep the blog design simple, but I'm weird like that. I like them fun - just not over done. Great choices. 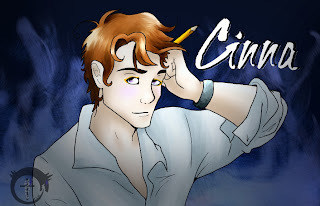 Cinna is awesome and I just started reading the 39 Clues series so I have to agree with Nellie being just plain cool. I love Cinna. I hadn't even thought of him, but what a great choice. Look forward to following you. Oh, and I like a clean blog - well designed. havent read the first two, but know of them. cinna is an awesome choice! & love the pics! Don't know the first two, but Cinna is an interesting choice. I really liked that character and wished he would have had a happier ending. I love Maximum Ride--though I thought the series went a bit downhill after Final Warning. Cinna is a fantastic choice -- I haven't heard of the other two. I was heartbroken about Cinna! I always did like Angel, but Gazzy was always a hoot to read about. And now this is just another reason for me to read the Hunger Games. Hi! New follower. I'm finally coming over from the Pay it Forward blogfest--just a little late. I enjoy your new design and agree with you on Cinna. Such a great supporting cast mate. Love the Killer Characters idea. So creative and fun. I like you blog design- I never saw the old one so i can't compare. Whoa... This was an introduction to a whole new set of literature for me :) I've heard of the Hunger Games books but I haven't read them (I've never even seen them)--might be on the lookout now. Thanks for broadening my horizons! Somehow I read this as "killing your supporting characters," as in X-ing them off! Glad that wasn't the case. I mean, I clicked through anyway, of course.